Every once in a while, I have an experience that changes me as a person – as a parent – as a woman. Most recently, it was reading the book, The Curse of the Good Girl. I was – and to some extent, still am - that good girl. Quiet. Polite. Demure. My daughter, on the other hand, is none of those things. She’s no ordinary flower and in fact, I’d argue that she’s not a flower at all. My friends suggest, perhaps, she could be a “Tiger Lily.” The nick-name has stuck because it describes my daughter perfectly. Fearless, bold and altogether, too loud. We don’t always jive. I’m often telling her to speak more quietly. Even more often, I give her the squinty eye and remind her “that’s not appropriate.” She, of course, thinks that anything that’s not appropriate is hilarious. It’s killing me. She’ll outgrow, yes? Probably not. In all likelihood, my daughter will have her own style and I’m pretty certain it won’t be understated. If I’m lucky, she’ll grow into a confident, authentic woman with a voice that she is proud of. 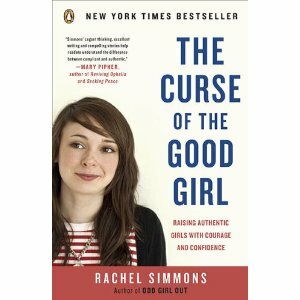 From communication to crying to criticism and owning up – Simmons cautions that the good girl believes “that conflicts is personal and ends relationships” and that girls define “leadership in terms of friendship.” While I’m trying to temper my flower’s tone and volume (molding her into a nice and well-mannered girl) – it is these words that stop me cold. Power, self-confidence and peace. I want it all for my daughter and I certainly don’t want her to measure her self-worth or influence based solely on friendship or worse yet, fear of conflict. For the first time, I see her fearless demeanor and loud voice as a pathway to her authentic self and to a success that only she can define. Keep raising your hand! Keep running to the front! Don’t be afraid to fall! • Try to tell the truth every day. Teach your daughter the language of truth-telling (respectfully). • Put a premium on authenticity. Honor mistakes; embrace limits and failures. • Be a little “full of yourself.” Curb self-deprecating comments; accept compliments. • Not everyone is going to like you. • Friendship is one of the many possible relationships in life. • When truth and friendship cannot coexist, get rid of the friendship. It seems the key to raising an authentic daughter is helping her to navigate the mind field that is known casually in the mom circles as “girl drama.” However, it’s far more insidious as the pressure to be “good” undermines a girl’s power and potential. Whether it is conflict or communication – The Curse of the Good Girl gives parents tangible strategies for breaking the curse and raising authentic girls with courage and confidence. Hear! Hear! Disclaimer: Michele received a free copy of The Curse of the Good Girl to review for the MamaManifesto readers.